The "51 Tough" defense uses trapping and deny opportunities to make it more aggressive than the containing 2-3 zone. First, the guards can occasionally come out to trap the ball as it crosses centre. The forwards rotate up in the passing lanes to the wings, and the centre is the safety protecting the basket. 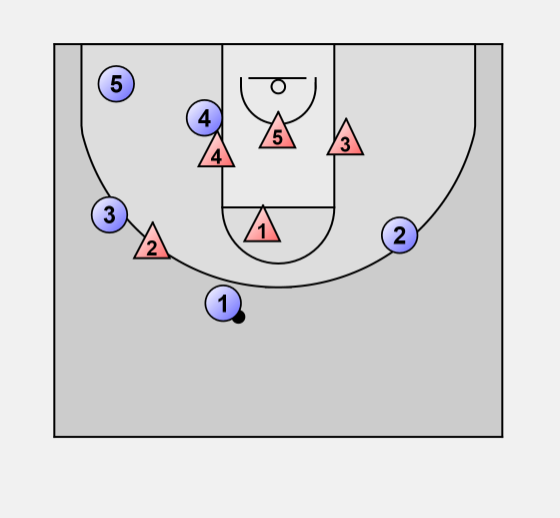 On a pass out of the trap the defenders would recover to the 2-3 zone. The guard and forward can trap when the ball is on the wing at or below the foul line extended (e.g., on a pass from the top to the wing, when the forward bumps up). The centre and other guard are interceptors, and the weak side forward is safety. Most trapping is done in the corner, by the guard and forward. Depending on the situation the other defenders could set up a defensive triangle in or near the paint. More aggressively, as shown by the arrows, the other guard could play in the lane of the pass back out to the wing, and the weak side forward would rotate up to cover. Any pass into the post area should result in an immediate trap by the nearest perimeter player. The forward and centre trap when the ball is in the low post, or in the "short corner" halfway between the basket and the sideline. Depending on the situation the ball side guard would help protect the basket (the high post), or contest the pass out of the trap, in which case the other guard would slide over to cover. 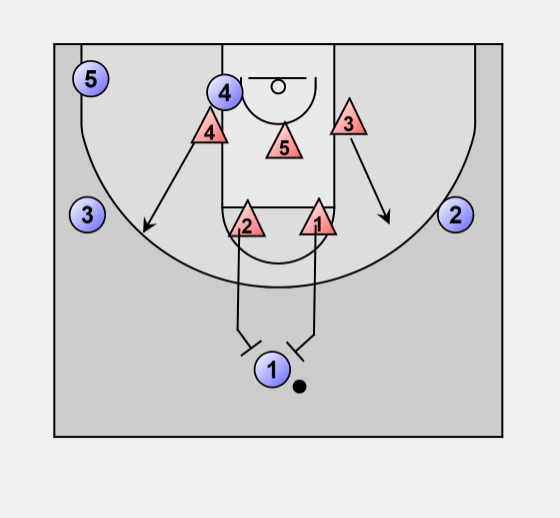 It can also be effective to deny or contest passes by moving into the passing lanes, instead of trapping. 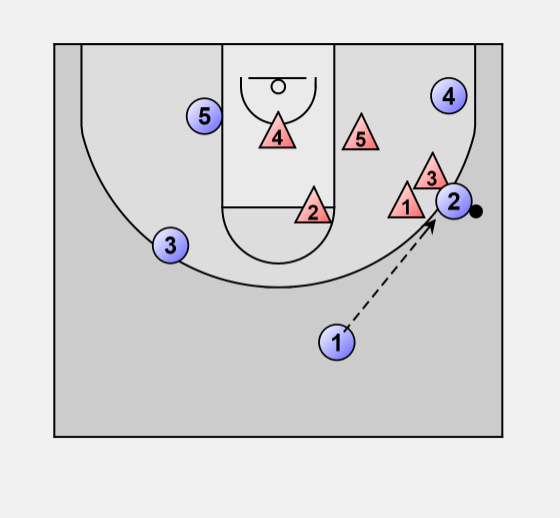 Here X4 contests the pass to O5 in the corner, rather than trap the ball handler with X2. The other guard X1 could also come out to contest the pass back to the point guard, in which case the weak side forward X3 would rotate up to cover nearer the foul line, discouraging the skip pass to O2, or intercepting a soft, lazy "helium" pass. Here X2 contests the pass back out of the corner to O3, rather than trapping the ball handler with X4. Since there are only two front defenders in the 2-3 zone, contesting the pass from point guard to wing may be difficult unless a forward plays out of her usual position. Here X2 denies the pass from O1 to O3, but O2 is open.